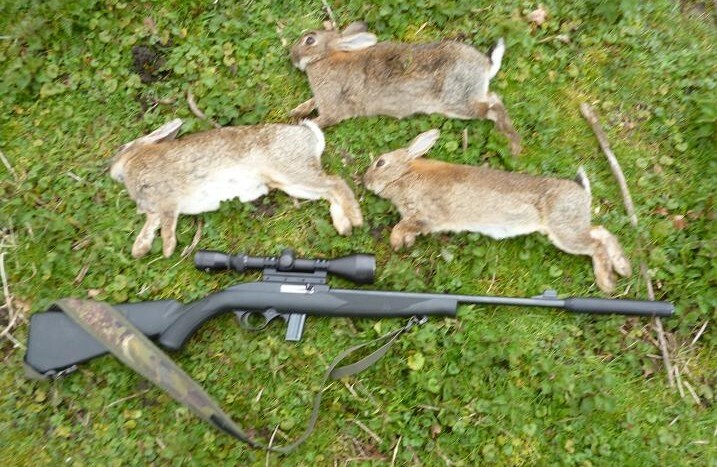 CZ 452 HMR and Magtech 7022 keep the customers satisfied. A couple of warm weeks banished the snow drops from the woods, to be replaced by the bright faces of daffodils and with green shoots and blossom appearing in the hedgerows, spring seemed to be rushing towards summer this month. The wind changed and we were back to the cold, with showers of hail raking the fields, forcing a warm jumper to be retrieved from the drawer. Also fooled were the rabbit populations on my permissions, their body clocks switching over to summer time, bringing them out in force to feed and gather bedding. The wet start to the year kept me off much of the land and I have been on catch-up ever since. 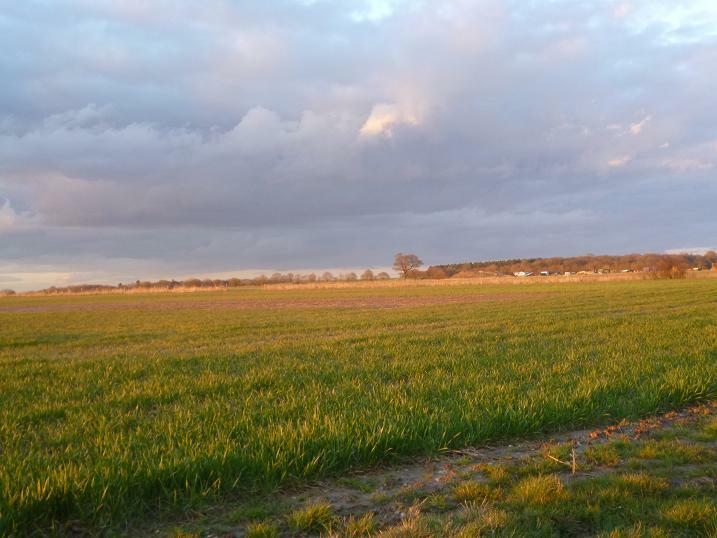 Getting permission to shoot on a landowner’s private property can be difficult, but a few weeks of good results can seal the deal and hanging onto that right, means regular visits to keep the numbers down. My first visit this week was to a previously infested farm, long off the urgent list and now on the courtesy list, but a phone call confirmed that small groups had begun to appear again among the hedgerows. 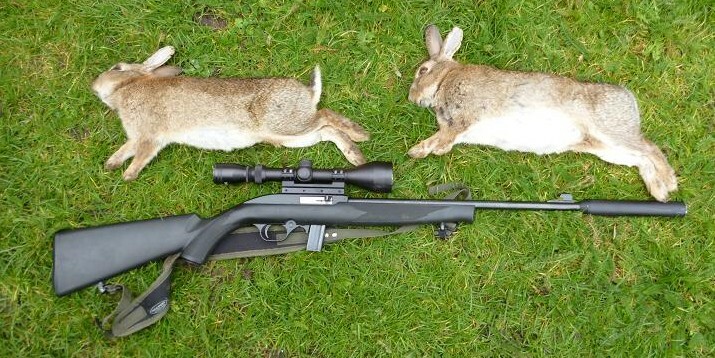 With no cover and spooky rabbits, this was going to be a case of lying out and waiting for long range shots with the CZ 452 .17 HMR. A recent shower had chilled the late afternoon air, as I entered the chosen field, where in the distance I could already see rabbits hopping to cover among the dividing hedge, a long cold warren being repopulated. Laying down my camo net onto the wet grass gave some respite, before lying prone with the HMR mounted on it’s bipod, the remaining net being draped over the rifle to break up the hard steel outline. In this raised position I could cover an arc, which spanned from 90 to 120 yards along the hedge, well within the point and shoot zero of the rifle. In twenty minutes of waiting for a movement, the temperature had plunged and I was beginning to regret not making an earlier start, when a scan through the scope confirmed a brown blob over to my left was a frantically feeding rabbit. At 12 magnification, I could see that it was facing away from me, no good for a shot yet, a hit in the body would destroy the meat. Waiting for it to turn, my eye caught another movement dead ahead. The scope locked onto the head just behind the eye in seconds, this unlucky rabbit rolling over without a kick, less than a minute after leaving it’s warm burrow. The first rabbit was now sitting up listening and would have been dead before it heard the next shot. At this a couple more materialised from the grass, their flicking white tails giving the game away, but they were soon out of sight among the hummocks. The same pair began chasing around behind the hedge, but I couldn’t get a clear shot, until eventually one stopped in a gap long enough to pay the price, a dull thud echoing back from 120 yards away. No more rabbits presented themselves in the next ten minutes, so I went down and collected these, noting several new burrows among the roots. I will have to be back sooner than intended. Further up the slope, I had a view along the edge of a line of blackthorn, where I’ve had some success in the past, but there was nothing showing, so decided that a chat with the farmer would be more productive, with the chance to show off the results of my labours over a fresh brew of tea. Later in the week it was the turn of the equestrian centre on the edge of town, somewhere that had so many burrows on the rides, that an accident was just waiting to happen, this being when a young lady rider was injured, after her horse tripped on a burrow. That was ten years ago and within two years of twice weekly visits, I’d decimated the rabbit numbers to within manageable quantities, mostly around the outer edges. 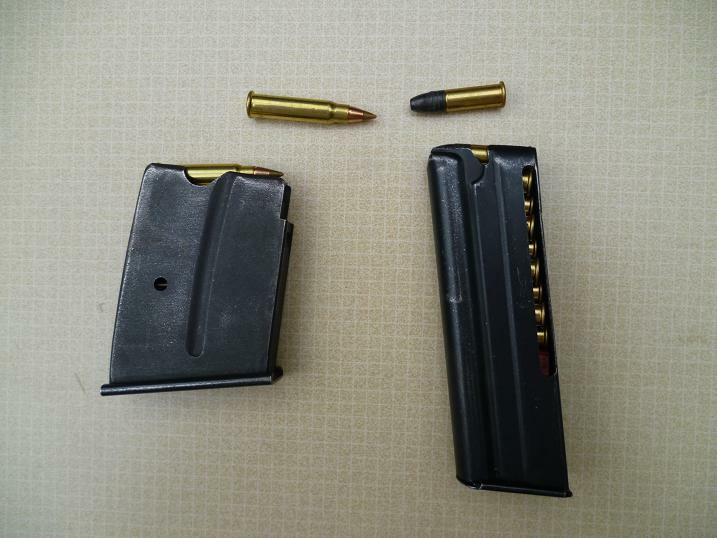 With horses in the fields, the supersonic crack from the HMR would cause mayhem, so I only use air rifles, or on this occasion the .22 Magtech 7022 semi auto rimfire, which is very quiet with it’s moderator. 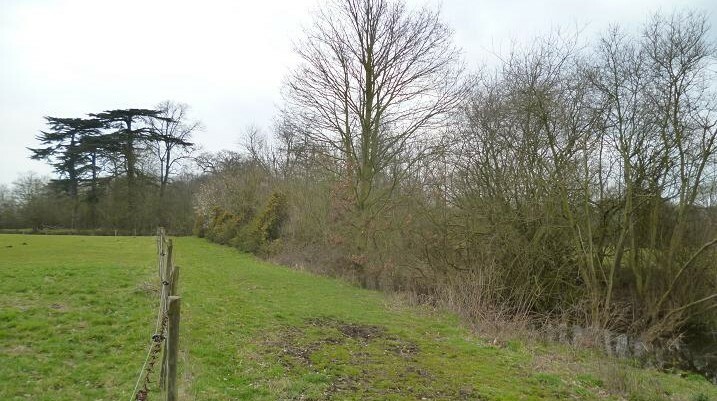 The owner saved me a walk round the 80 acre site, pointing out the hedge line along the far boundary, where he had put warning branches in the holes. 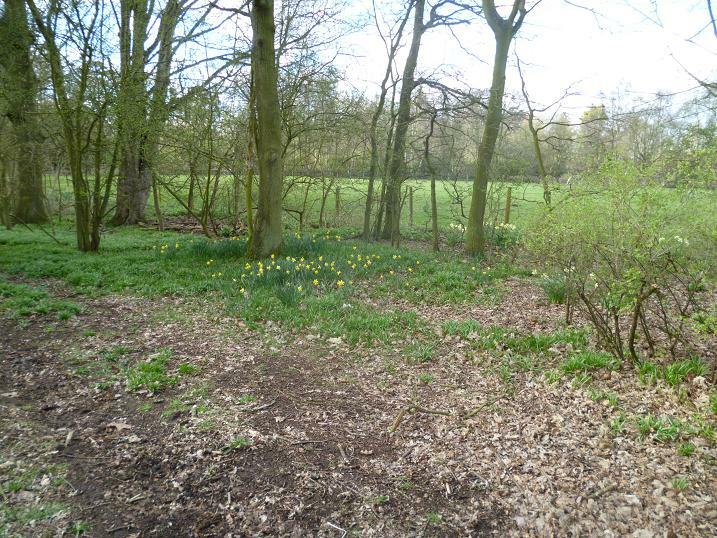 This was one of my first permissions and it remains the most interesting, having once been part of a 17th century stately home, the big house and lake are still on one boundary, while the land stretches south towards the town and an old green lane, it’self bordered by urban greenery, a golf driving range, football pitches and allotments. 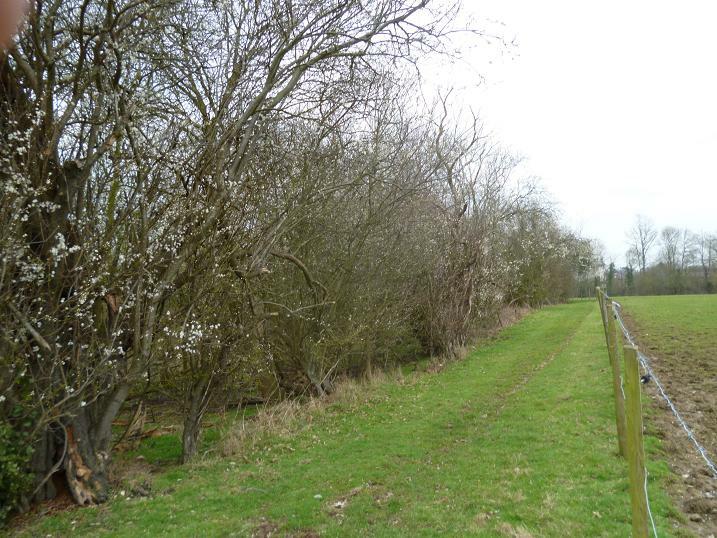 These borders have not changed since medieval times and there are few straight lines along them, making it ideal for short range rifles, with plenty of cover for getting up close and personal. 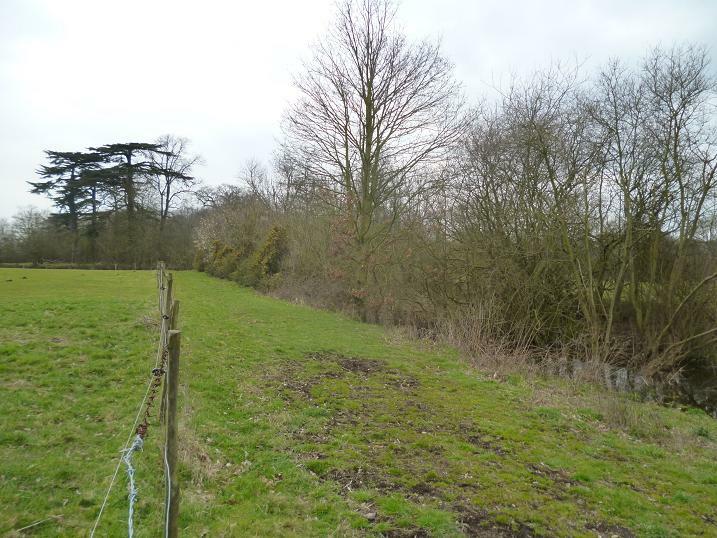 My route took me past the old wooded driveway, which is raised above a moated ha ha wall, this area was once a happy hunting ground for me and the rabbits that populated it, but now it is devoid of my furry friends. Left alone for a few years though, they will be back. 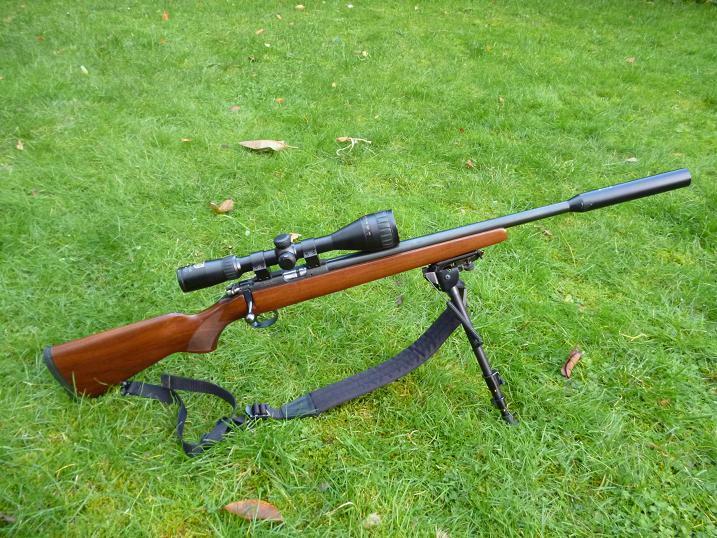 With undulating ground, a fixed rifle bipod is limited on this permission and have found a home made bipod a great shooting aid. This only took about two hours max to construct using a Hike telescopic walking stick and a plastic coated tubular garden pole, an old leather belt and of course some sticky black plastic tape. On my walk through, I spotted a pair of rabbits feeding about 100 yards away in open ground, but was in clear view and didn’t fancy crawling forty yards to get in range. With the HMR, this would have been a case of resting it on a fence post, or the bipod for an unmissable shot, or if approaching through the wood, I could have fired from cover down from the ha ha at 30 yards. I made a mental note for next visit. This time I walked steadily towards them to test their reflexes, one sitting up at 80 yards and both trotting off by 60. 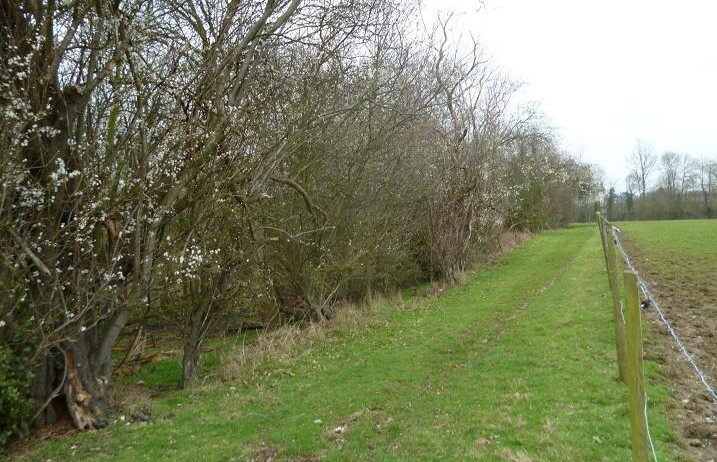 I continued on to my intended area, where the path zig-zags round the edge of more woods and a peek around a holly bush, revealed three rabbits feeding on the path, the nearest 70 yards away. Backtracking, I cut through the wood, trying to avoid treading on branches and dead leaves, placing my feet as carefully as possible, until I reached a point, where there was a clear view down the path. There were still two left and placing the Magtech in the vee of the bipod, while still within the trees, I fired at the nearest 40 yards away, a satisfying “whomph” telling me that the chest shot had hit home. 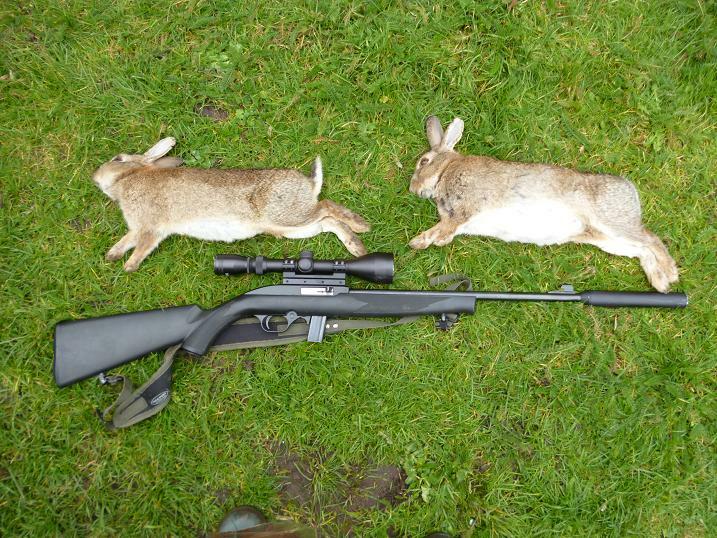 The remaining bunnie darted back to it’s burrow yards away, before I could bring the rifle to bear. Moving up to the next corner, a quick look through the bushes showed more feeding rabbits only 20 yards away. Stepping back, the scope was reduced to 4 mag, I got down and belly crawled to the corner, where the rifle was pushed through the grass for an instant head shot. This startled the rest into a stampede back to safety, none waiting round to see what had happened. Two more big rabbits for the pot. I continued my walk round, but saw no others and as this had been only a scouting trip to find the hot spots, I was soon back at the van to join the rest of humanity in the traffic. 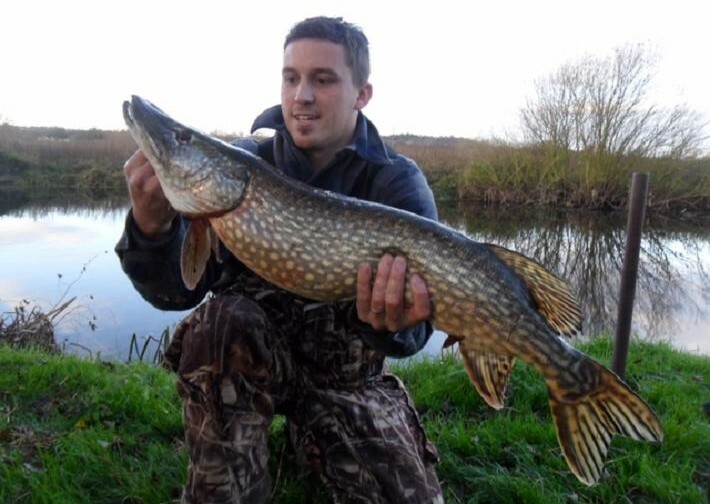 When this picture dropped into my e-mail inbox from fellow club member Lee, along with an invite to join him on his next pike fishing session, I jumped at the chance, just to go along with my camera to see how it was done. 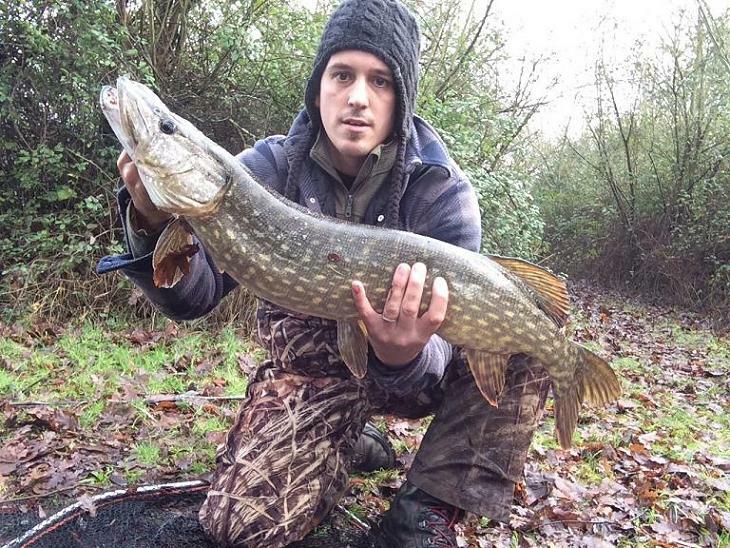 For our morning session, Lee took me to his local water, where this near 12lb pike was caught on a lure, a well matured gravel pit surrounded by trees, with features every twenty yards, bays, roots and reed beds in abundance. Early mist had cleared, with just a hint of ground frost and the lake had returned to it’s normal level following flooding, a white tide mark evidence of the level two weeks before. Lee’s tackle was a revelation to me, a seven foot Savage Gear lure rod, coupled to an Okuma Tormenta bait caster reel, loaded with sinking braid, that gives a direct feel from rod top to the lure. A far cry from the nine foot heavy feeder rod and Garcia ABU 506 closed face reel loaded with 15lb mono, that I have been using for years. 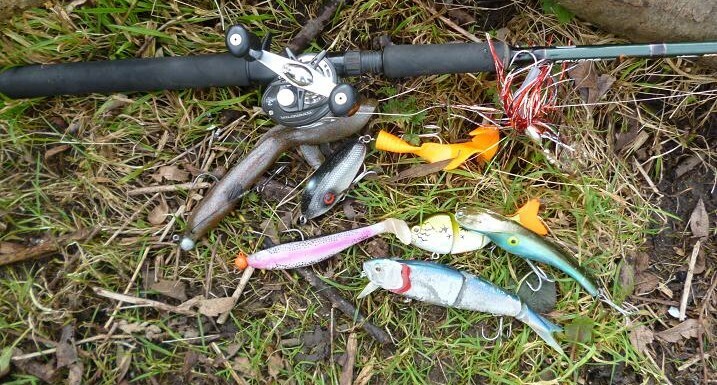 Likewise a small selection of his lures, jelly eels and various multi-bodied plugs were an example of how far lure fishing has come since the simple Mepps spoons I’ve used in the past. 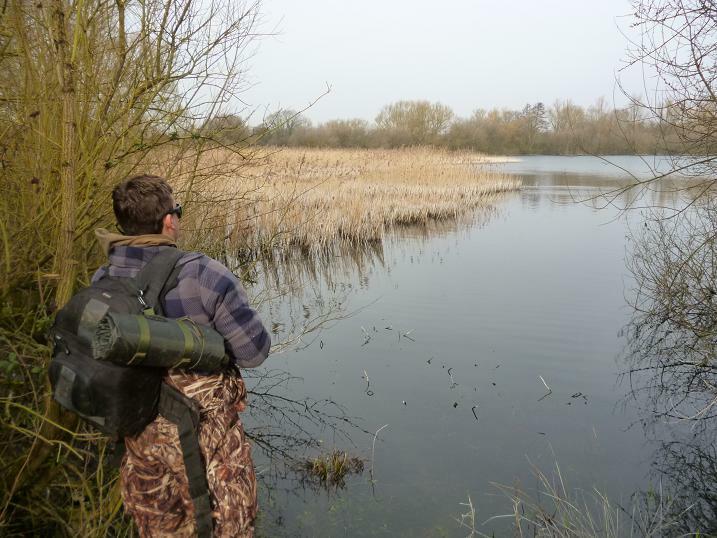 We walked the bank first, with Lee pointing out where he’d had pike before, starting to fish at an inviting looking reed bed, expecting a strike, or a follow from each cast, his outfit easily capable of reaching the edge of the reeds fifty yards away. 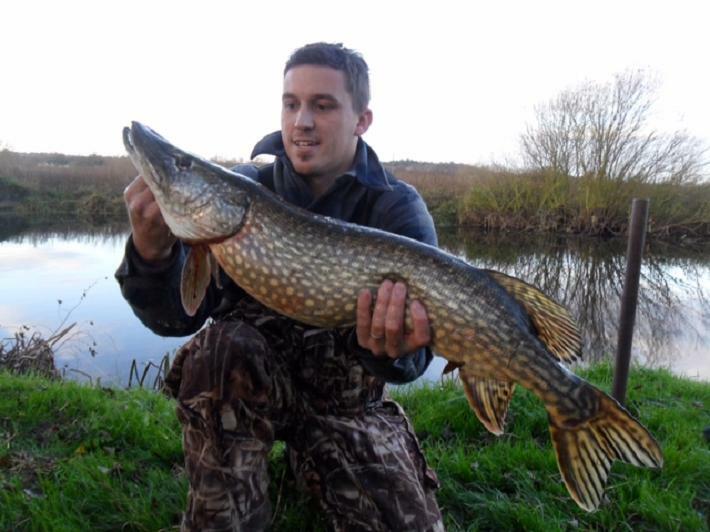 This is usually Jack Alley, but today the smaller pike could not be persuaded to take, despite frequent changes of lure. Lee joked that he wasn’t used to fishing under pressure, feeling the need to put a fish in front of the camera. 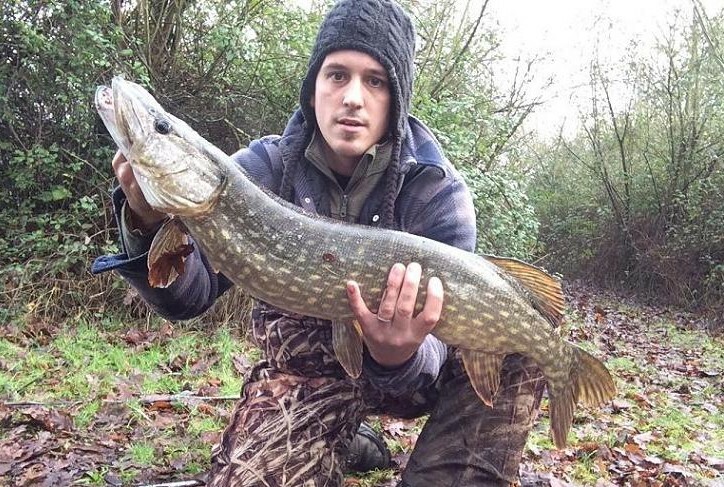 We moved down into a heavily wooded area, where he’d had good pike before and a few casts in, there was a swirling boil just feet from the bank, as a big fish veered away from his lure. Encouraged by this promising action, Lee rang the changes in an attempt to tempt this fish, but maybe the clear water was against us and it failed to move to the lure again. As the saying goes, “here’s one I had earlier”, a finely marked nine and a half pounder from this swim a month earlier. We moved on, trying each gap in the trees, expectant of a take at the slightest tap of the rod, as the lures worked their magic among the roots. 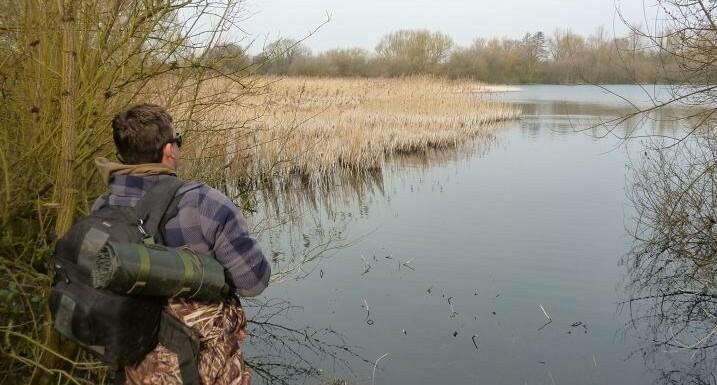 This is the attraction of lure fishing, with dead and live baiting for pike, it’s a waiting game, but a lure can be taken the moment it hits the water, or just on lift off, going from inaction to explosive action in a matter of seconds. Two hours had passed quickly and each new area offered up several choices of holding spots, this bay being a pike fisher’s dream, but once again Lee’s efforts were frustrated and we moved to a narrow spur, that at first glance had nothing going for it, until I saw a small fish jump, followed by another. Either a small jack pike, or a perch was attacking a shoal of roach. 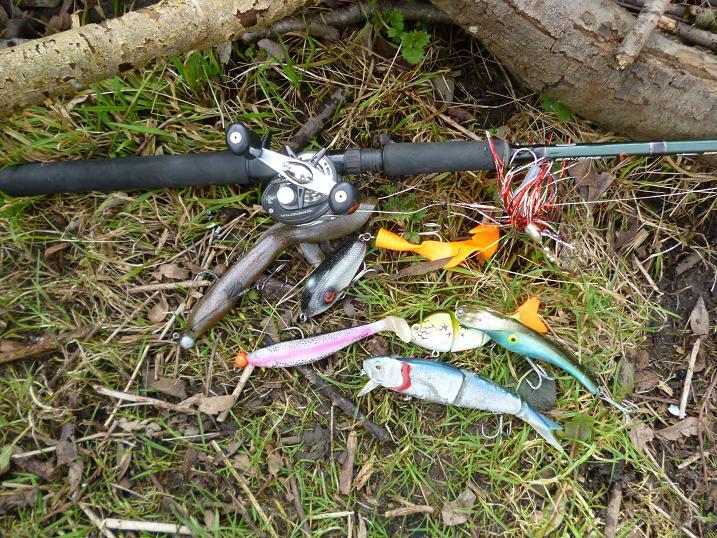 Another change saw a fish bodied lure with a bright jelly tail clipped on and cast out to the topping shoal. Third cast through, the rod bent into an arc, as the lure was seized and Lee instinctively struck hard to set the barbless hooks, a boil on the surface indicating the exact take point. 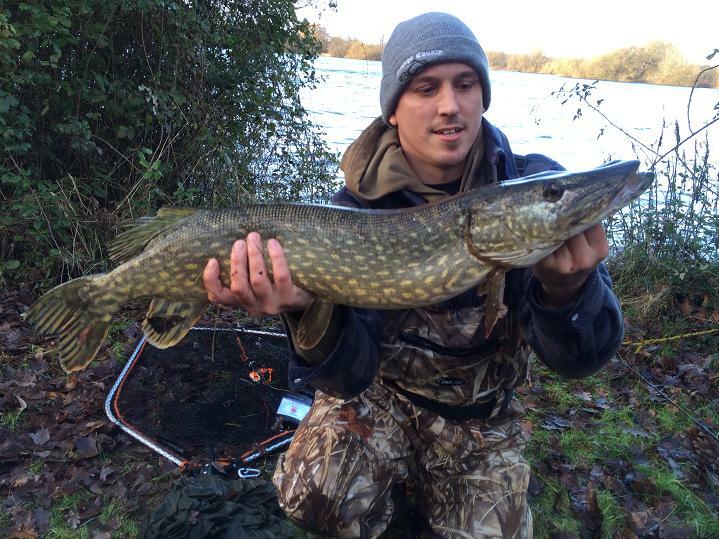 The rod kicked as the pike shook it’s head, before heading for open water, pulling hard on the reel drag. I went back to collect the landing net, returning in time to hand it over to Lee for the end game of an epic battle, the look of satisfied relief on his face saying it all. This young, fit guy had still managed to break a sweat on a cold morning. Job done! What a fin perfect beauty. 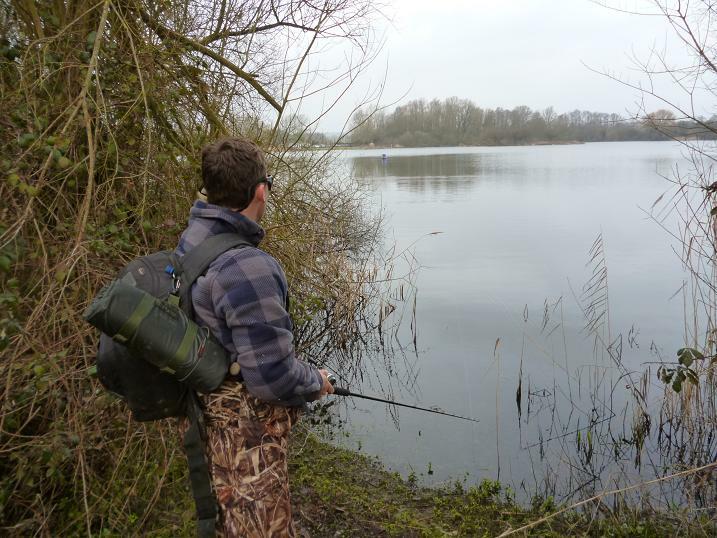 A quick spell in the weighing bag ran the scales round to 11lb 8oz, then this heavily camouflaged killing machine was slipped back in the water. 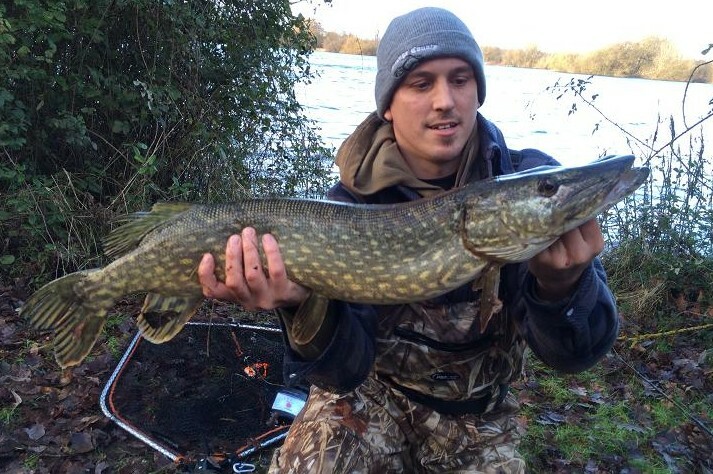 Not content with his capture, Lee ran the lure through several times more, saying that two, or three pike will often work together to drive a shoal of bait fish into such an enclosed area. Not today though and both with family commitments that afternoon, we headed back down the motorway. A week later another photo dropped into my inbox. Lee had been busy again. 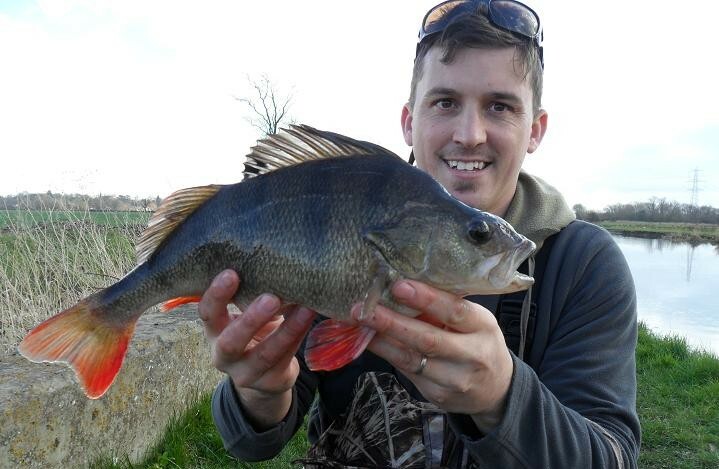 While visiting relatives in Leicestershire, he’d found time to pop down to the river Soar for some R&R and bagged a personal best 3lb 6oz perch. This was taken on a Savage Gear 3D white crayfish lure. 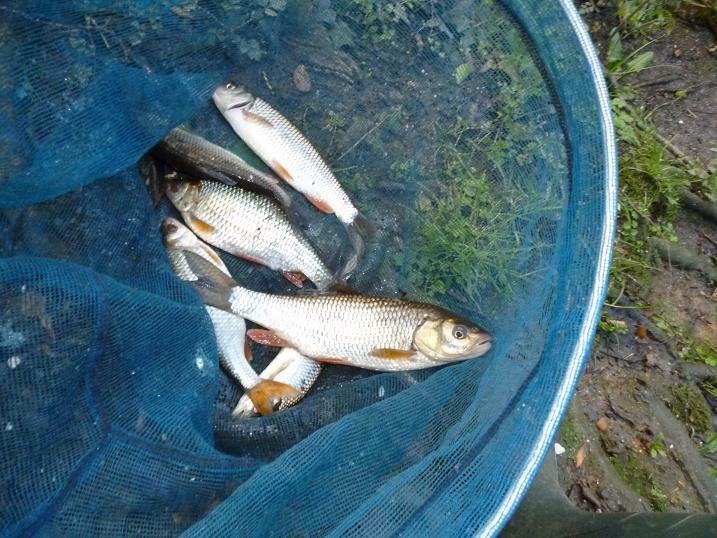 A return visit to my local river, found the level down nine inches and running at a slower pace than last week, when trying for roach, I struggled in the conditions, being broken by two big fish, carp, or chub. 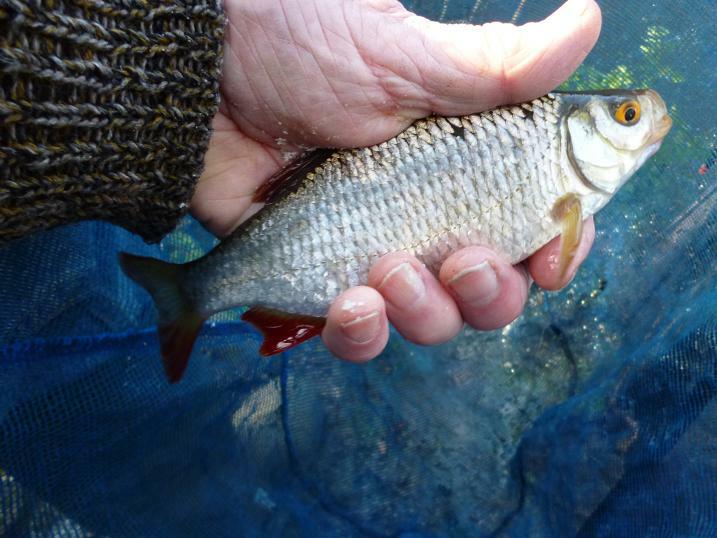 After being broken for the second time, I’d left with a feeling of unfinished business, determined to return before the end of the coarse fishing season, for a decent crack at the roach,that live in the fast water of the outfall. 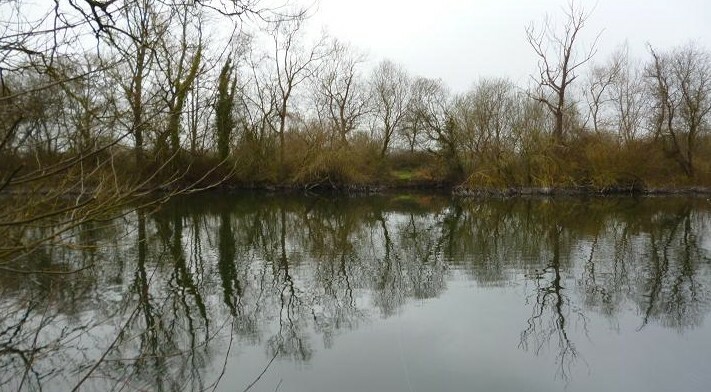 Not wanting to be broken again by big fish, I’d scaled up my tackle to a six No6 Middy alloy stem stick float on a 5lb main line, with a size 14 to 3lb hook link, a compromise that I hoped would not put the expected roach off taking my bait. 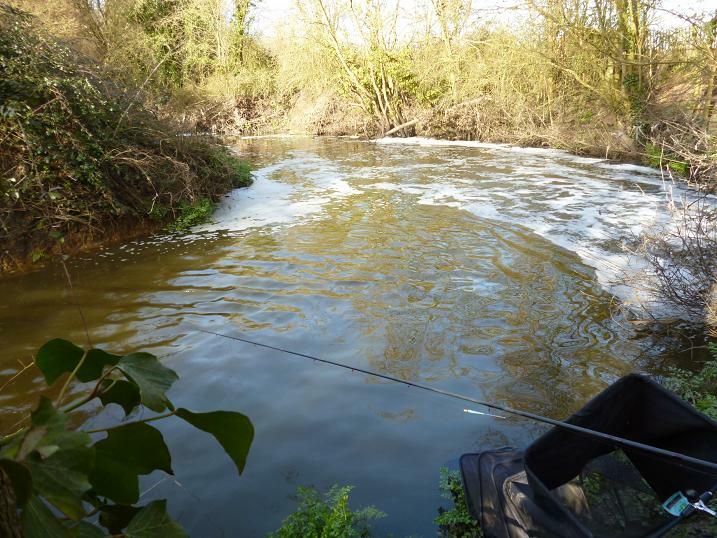 I needn’t have worried, as minutes after introducing a couple of balls of liquidised bread down the middle of the run, my float gave a couple of rapid dips, then sank out of sight and the first of many clonking roach was putting a bend in my rod. The hot spot was the edge of the fast water, often just holding the float back as it drifted into the area, hooked a fish. More feed brought the roach out into the main river, and I was getting into a rythm, cast, trot, hook and play to the net, until I tried to rush a half pounder, which came off, taking the shoal with it. 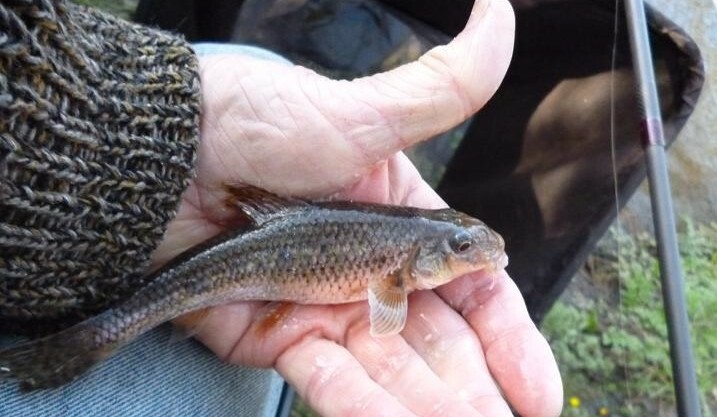 For a while small chub and big gudgeon took their place, the chub dashing all over the river, while the gudgeon bored deep. 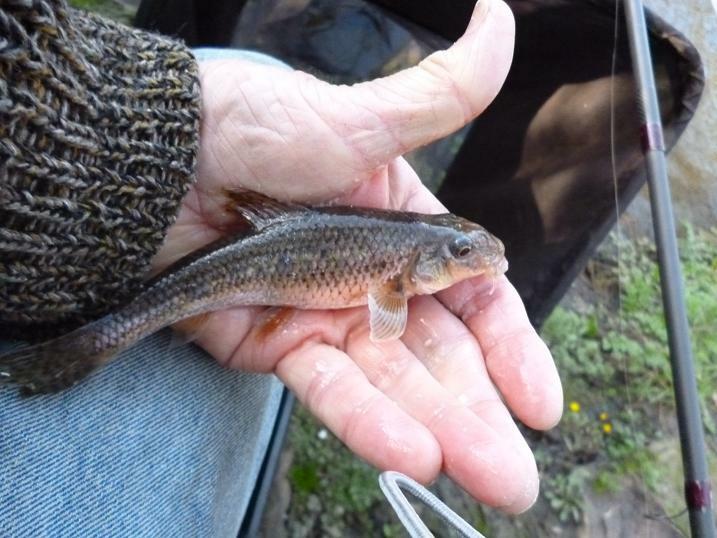 Some of the gudgeon were monsters approaching 8 inches long and very fat, hugging the bottom, giving the impression of a much bigger fish. The Middy alloy stem stick is now one of my preferred floats for most shallow river conditions, the tip rising up on the shoulder, when held back, while the bulk of the float stays down, giving more control to ease the float through a swim. My next bite entered the foaming weir stream and headed upstream, the strike hitting into solid resistance, that had me guessing at the species on the end, a deep thumping fight keeping the fish out of sight, until brought up to the surface for the net, revealing a roach-bream hybrid of about 8oz. 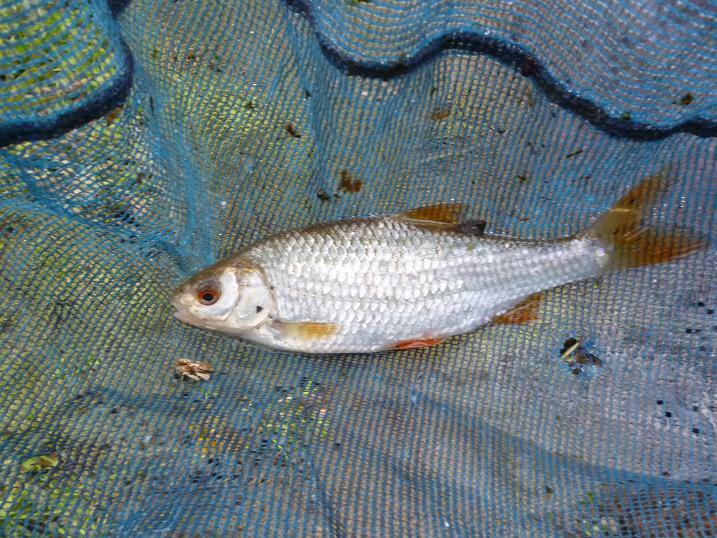 Next to take was another unexpected fish, a 6oz rudd, the float sailing away as the rig followed a ball of bread down the swim. 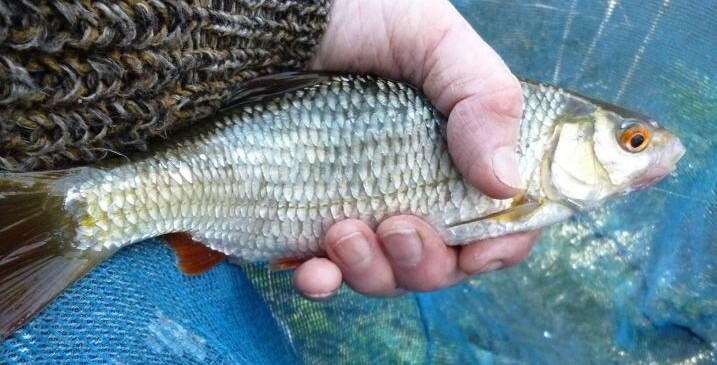 Another hybrid, a rudd, a few small chub and several gudgeon coming in quick succession. This interlude was soon over and the roach moved back in on the bread feed with a bang, getting larger with each trot and I make no apologies for including more pictures here. 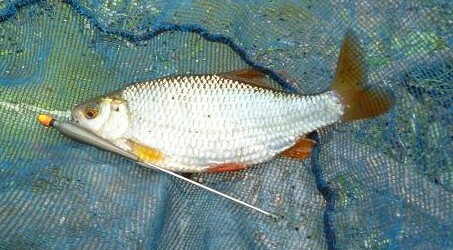 I love catching roach, especially big ones. The roach above could have been a season best for some people, but the float kept going down and they continued to fight their way to the net. The bites were beginning to get few and far between in front of me, so I made a cast to the middle of the faster water and trotted down towards the bend, striking when the float dived, hitting into a fish that ran hard down stream and backwound rapidly to counter it. 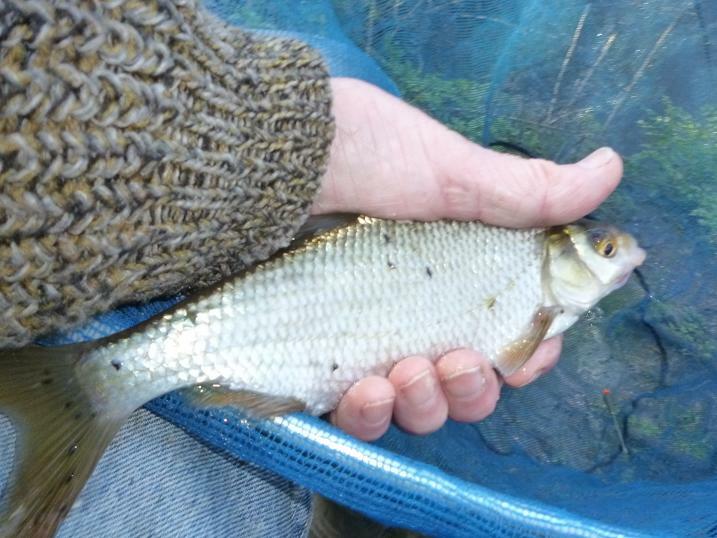 A chub I thought, but then saw a broad flank with a flash of red, a good roach and the best of the day, which treated with respect, I netted minutes later. This was a deep fish that, when laid against my bait tray, had it’s tail over the edge. The tray measures 11 inches, so the roach was over a foot long. 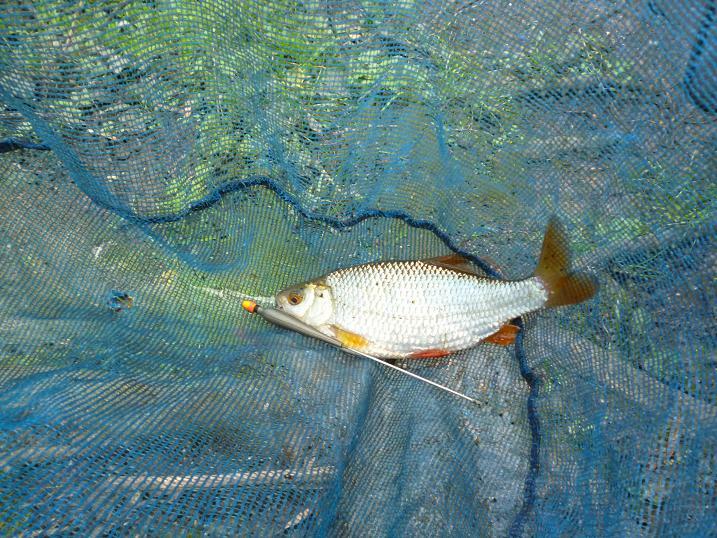 A couple more smaller, but equally deep roach followed from the fast stream, before trying a change to a brandling on the hook, having raided my compost heap for the worms before I left. I’ve often thought the concrete structure of the weir could hold some perch, but usually only fishing bread, I never catch any. Hooking the size 14 hook once through the head of the brandling and letting it be taken by the flow back in towards the weir, it zoomed out of sight. 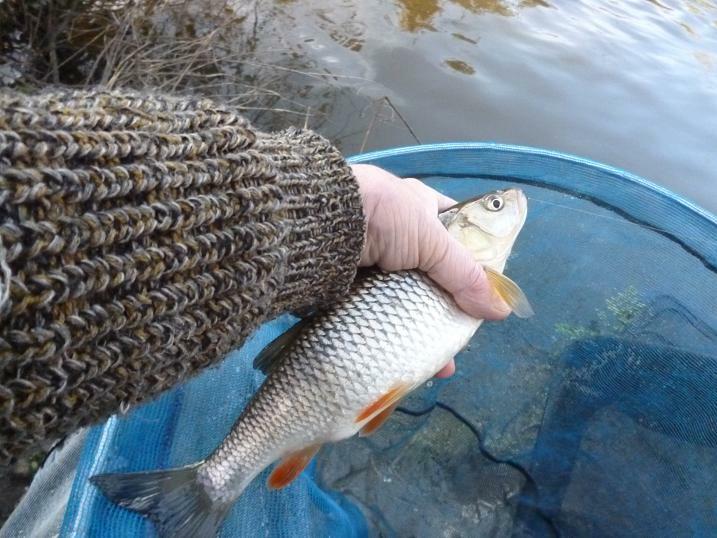 Not a perch, but a 4oz chub had seized on the live bait, where several times the 6mm bread pellet had passed. 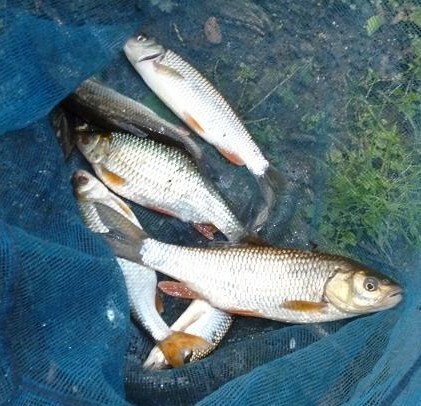 This was not a fluke and these small chub lined up to take the worms, until one came in under my feet to be missed by the landing net and dive into a submerged bramble, snagging the hook. I pulled for a break, only to then flick the float into the bush on my right. Again pulling for a break the precious float hung suspended over the water. 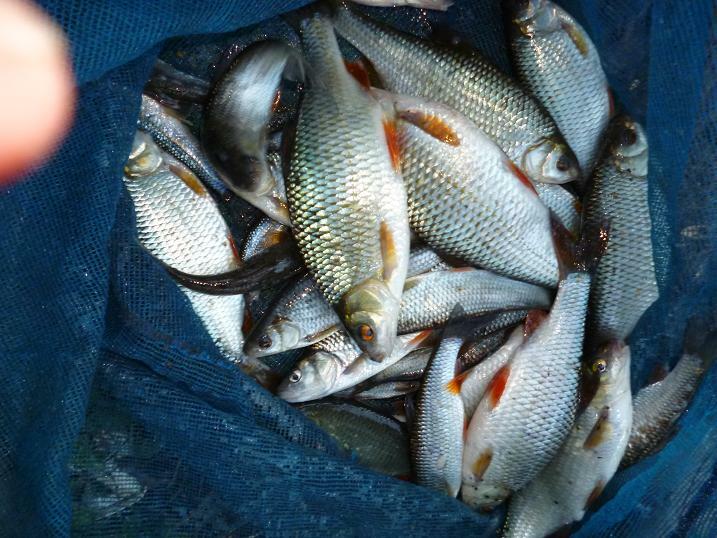 Although there was still over an hour of daylight, I decided not to be too greedy and quit while I was ahead, having finally found my searched for shoal of big river roach, plus a few surprise fish along the way. 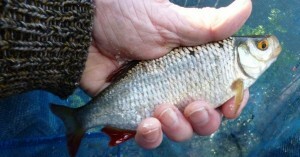 I also learned that the chub will go on feeding, if you switch from bread to worms. 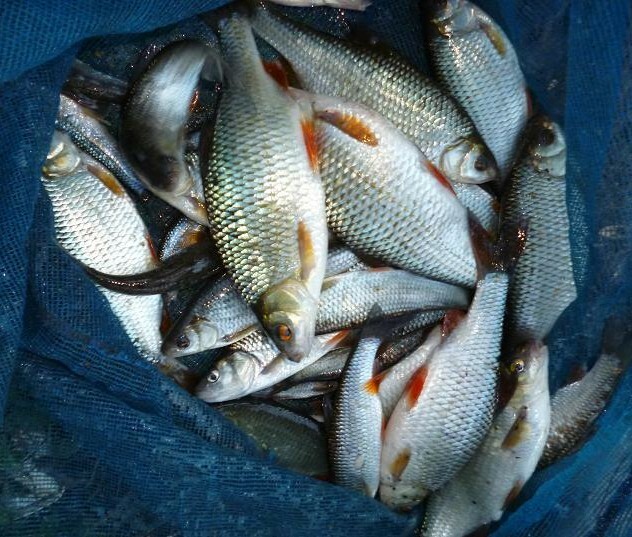 I had a final look at this impressive over eight pound bag of mostly roach, taken during a busy three hour session from this small tributary of the Thames, then set about rescuing my float from the bush. 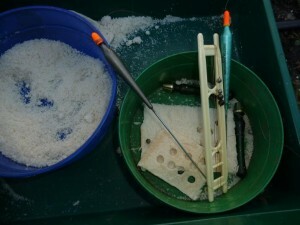 My last fishing expedition had resulted in tangles and broken lines, so it was time to retire to the comfort of my workshop to tie hooks and make up some stick float rigs. This is, in modern terminology, my Man Cave, with a bench running the 12 foot length, a swivel office chair, a good vice, a heater and even a downgraded music system that can entertain me with radio, or CDs. Through a connecting door is my garage with a lathe, a press and pillar drill. 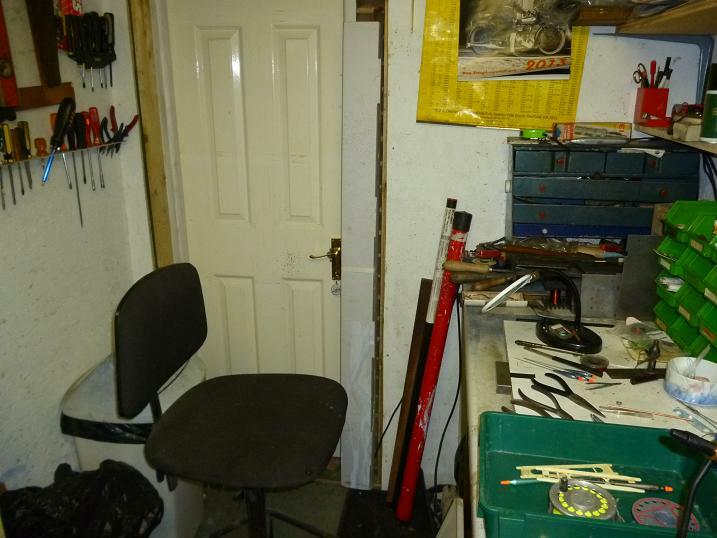 Surrounded by my various tools and boxes of bits lining the bench, it’s the ideal environment to work on fishing tackle, or my rifles, while planning my next outing. Man Heaven. The Shed. The other door is opposite the kitchen door and this opened with my wife offering a cup of tea and asking if I would like to go shooting that afternoon. In wife talk, this means, if you want to go shooting, you could drop me off in the town for some shopping on the way, then pick me up on the way back. This is not ideal for either of us, as we are under a time pressure limit to do our things, ie number of shops to be visited for her and number, or lack of rabbits to be shot and cleaned for me within an agreed time. Obviously I agreed to her wishes, as anytime fishing, or shooting, is time to be savoured, although it’s amazing how the time goes, when you’re having fun. This was going to be a brief hit and run excursion for me, with probably no more than 90 minutes field time and decided to have another crack at the rabbits near the entrance to one of the farms. They are always there, when I drive in, lazing on a hill to my right, but scatter as I drive by to park from the lane. 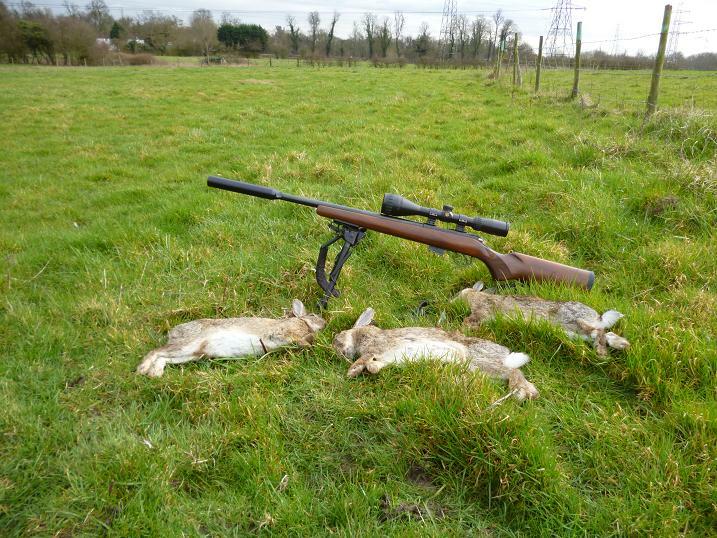 This is not good PR for me, as the farmer got me in to shoot the rabbits and there they are for all to see. 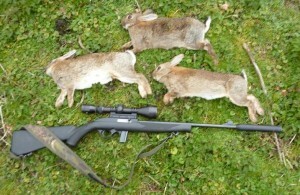 I’ve been picking them off one, or two at a time with the HMR at range , but a new approach was needed. One option would be to park up the lane and stalk within range, but shooting from a public highway is not legal and there is no gate apart from the main entrance to get onto the land. While sipping tea, the idea came, that maybe it was the sight of me at the window of the van, that was scaring the rabbits. What if I reversed in? They might not see me from the other side of the cab. It was worth a try and after dropping my good lady at her hunting ground, I set off for mine. Approaching the farm entrance at a crawl, I could already see several rabbits on the hill and drove past, then slowly reversed in on my mirrors, not looking over to the hill. It was working. I slid out of the driver’s door with my Magtech 7022 .22 semi auto, fitted the ten shot magazine and cocked the action behind the cab, then resting on the windscreen, looked over to see how many were left. There were seven rabbits, framed by the branches of a tree, about forty yards away. With it’s homemade moderator, the Magtech is almost silent, the thump from the RWS subsonics hitting home being louder. 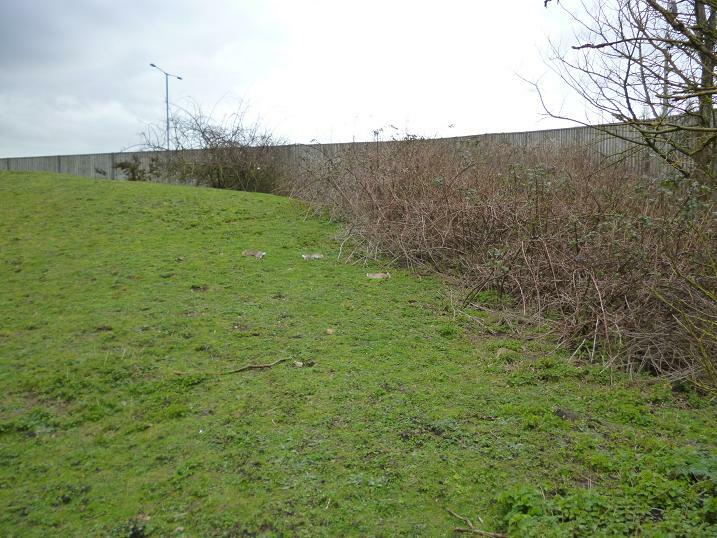 The first two were a foot apart and went down in a few seconds, the others, startled, ran; one not far enough though and stopped at the edge of the brambles and the third shot bundled him over. It was over in under ten seconds. I waited a few minutes, as sometimes a startled rabbit will jump back out, but not this time. Three out of seven is pretty good going. The semi auto can fire rapid shots, but the shooter needs to take the time to get a good steady bead to hit anything. I’d rather not take the shot, if it risks a wounded runoff. 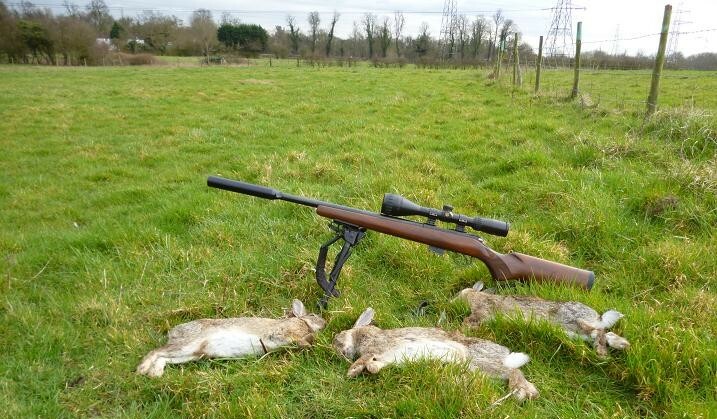 With these three cleaned ready for the butcher, I swapped over to the .17 HMR , climbing to a vantage point with a view over much of the farm, but with time ticking, I called it a day after twenty minutes of non activity. Not even a crow, or magpie to test my sights on. As I drove away, I wondered if the reversing trick would work next time. Chub and roach against the odds. 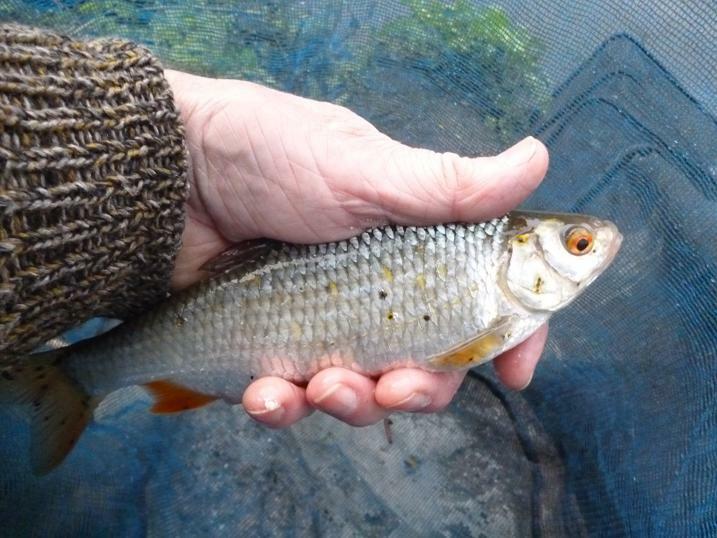 For three months my small local river has been up and down like a yo-yo and the last outing at the beginning of the year, when the levels dropped for a few days, had yielded mostly gudgeon, taking only a couple of my target roach on the day. 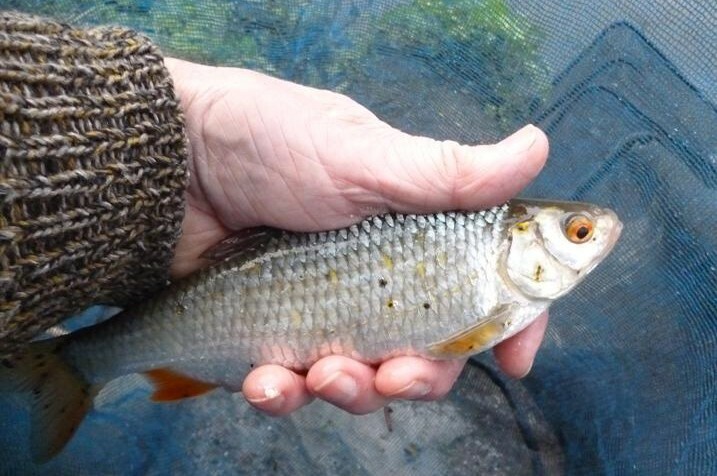 With just a couple of weeks left to the season, my chances of getting a decent catch of roach have been reliant on some deluge free days. The river has two sources of water, the natural one, which drains the local pine forest and the main cause of the sudden rises in levels, when it acts as a drain to the town and it’s surrounding housing estates. 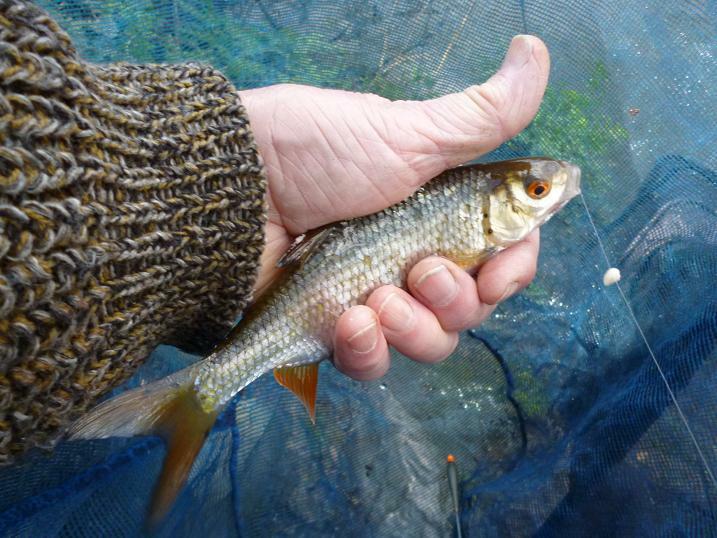 Where the river is joined on a bend by an outfall from the town water treatment works, I set out my tackle in the hopes of repeating past success among the roach that gather in the aerated water. Despite dry days, the river was still rushing through though, causing surface ripples as it passed over the slower water beneath, while coupled with the colour of strong coffee, the odds of even getting a bite seemed stacked against me. With more heavy rain forecast for later in the day and the rest of the week, it was a case of now, or never. A fallen tree to my left had created an eddy at my feet and I set up with a Preston 4 No. 4 alloy stem stick to trot this shallow edge, down to an over hanging bush. 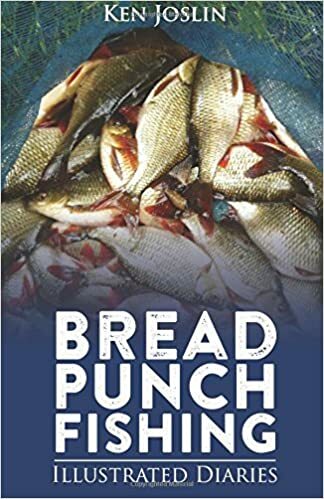 With bread punch bait and liquised bread as feed, I dropped a couple of balls in upstream and watched them disappear into the murk, as they washed by. Set six inches over depth, the float was eased towards the bush at half speed, until it reached the foam and held for a minute. No bites. Each time the 7mm pellet of bread was missing on retrieve, probably dragged off by the strong current. I shallowed up a foot, dopped in another ball of bread and followed it down with the float. 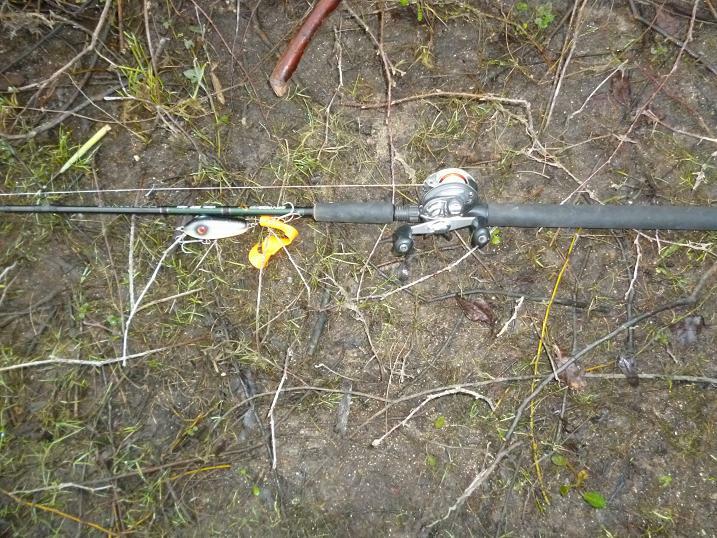 At the bush the float dived away, I struck and the rod curved over with a fish. A couple of vicious bounces of the tip and it was off. Curses. Not a good omen to lose the first fish, especially a decent one on a hard day. With no more offers on the inside line, I gave the fast water a go, throwing the feed upstream into the fallen tree, while adjusting the float to fish deeper, just checking and running the float through each yard down into the foam. The float dipped and I missed it. Next trot, bang, the float slid sideways and I was in again. Off again. I checked the hook. I’d finally run out of my old Mustad fine wire size 14 crystal hooks, having bought the box of 100 in Days of Olde and was trying out a heavier gauge 14 whisker barb. Maybe I wasn’t striking hard enough. 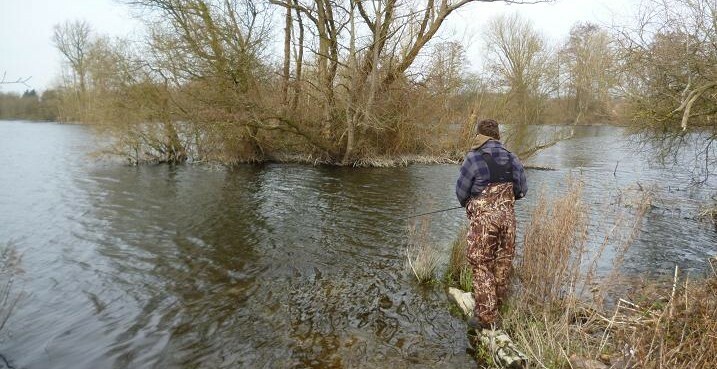 I came back inside and at the bush watched the float stab down and across, paused, then a firm lift had the rod tip pulling down into the river with the force of the running fish. I backwound hard on the reel to ease the pressure and the unseen battler was checked midstream round the corner, it swimming back towards the bush in a power run. Pushing my 14 foot rod out over the stream, the fish turned and rolled; it was a decent chub, not a monster, but needed care to get in the net. 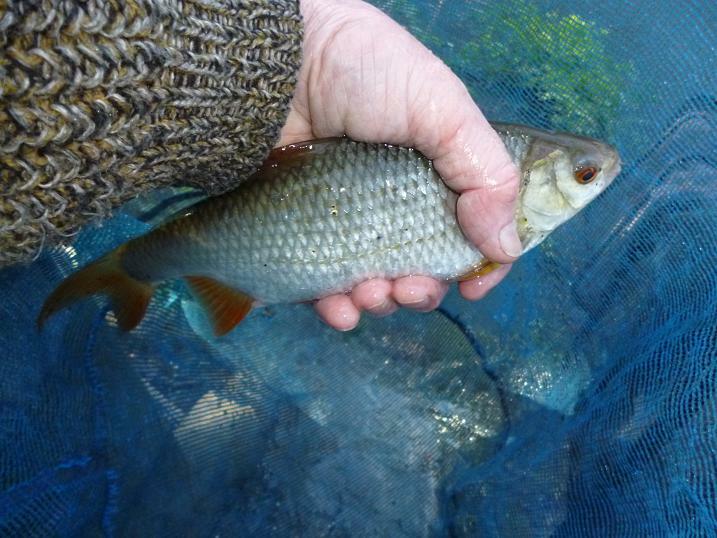 A fish at last, still no roach, but there was time to draw them up into my swim. A couple more trots down and I was in again, a juddering fight, which I thought was a roach at first, until the white mouth of a smaller chub broke surface. This was better, another miss, then a big gudgeon. Hope THEY aren’t moving in. 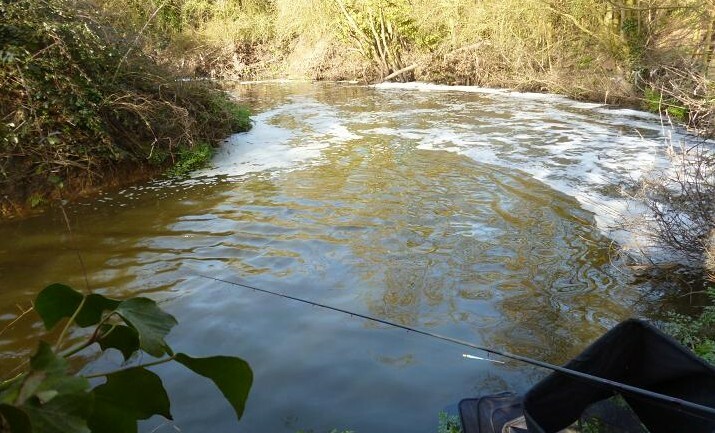 Half way down the swim, under my rod top, the float sank away and the rod bent double, as a big fish zoomed across and upstream into the sunken branches of the fallen tree. It bucked and dived hugging the bottom, running past my feet towards the bush roots. Sidestrain, then ping, the hook link broke at the knot, sending the rig into a messy bird’s nest tangle round the rod top. What to do now? Cutting away the tangle, it was quicker to rethread, tie on a new loop and fit another float rig, this time a heavier Middy 6 No.4 alloy stem to cope with the faster water. 5 minutes and I was back fishing. 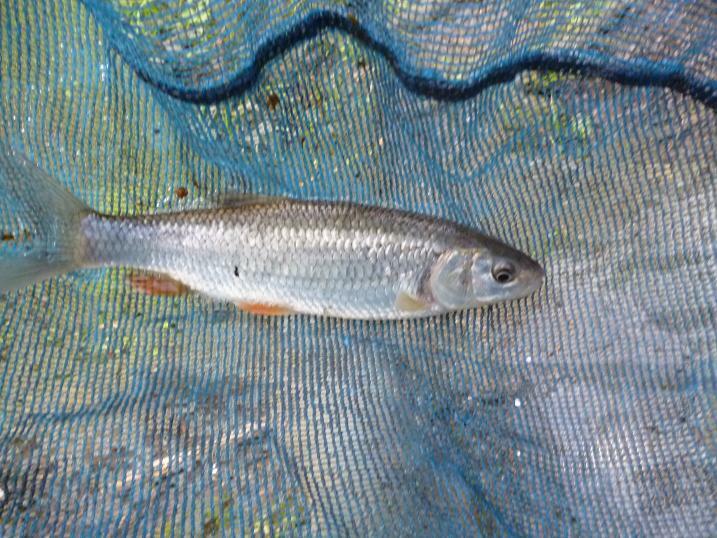 Bulking the shot a foot from the hook, I ran through under depth to the foam and saw the orange tip glide upstream towards the outflow, striking harder now into a hard fighting 8 oz chub, that stayed on to the landing net. The barbless hooks set themselves in a fishes lip with the minimum of effort, while these new hooks needed pushing home. 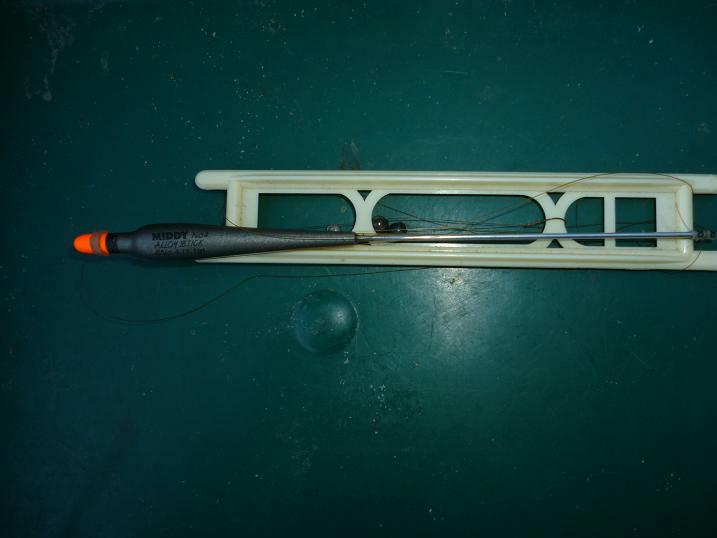 The so called microbarb, also held on once set, making removal harder, while hooking my wool jumper and the landing net needed scissors to get free. I’ll try pinching the barb down next time. 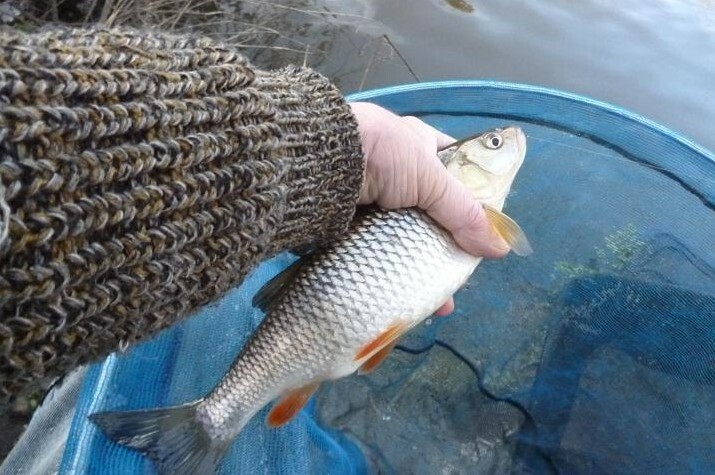 Another chub followed soon after, putting in a small ball each trot, bringing bites a yard up from the foam. 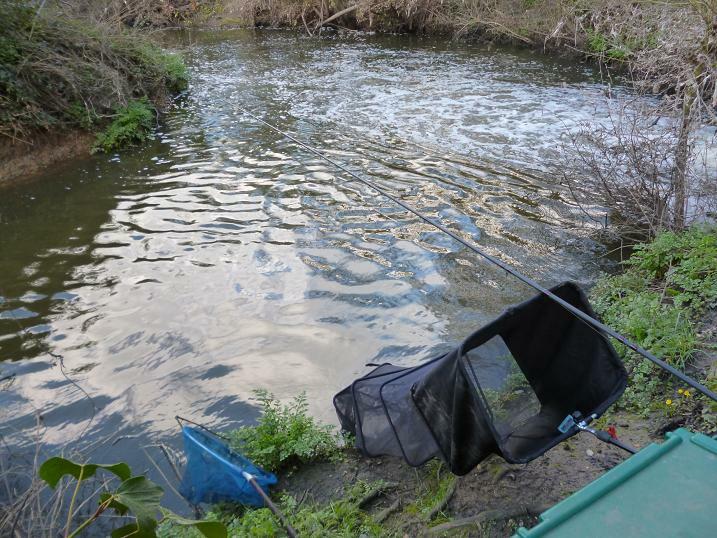 Then at last, bob, bob, under and I was playing a very good roach, that darted about the swim, at my feet one second, on the far side the next, eventually getting it’s head out to slide over into the net. A deep 10 oz fish. I’d tried going over depth again, holding back hard, keeping a tight line to the float and got this roach, so I followed through again with a repeat performance, this time an 8 oz fatty, the roach seemed to want it slowed right down in the fast water, where the bread was now coating the bottom. This was the method for the roach then. Holding back following another ball, the float sank and the rod pulled round before I had a chance to strike. This was a very big fish, a chub, or even one of the carp that live here, a dead weight that just sat in the flow, nodding the rod top. 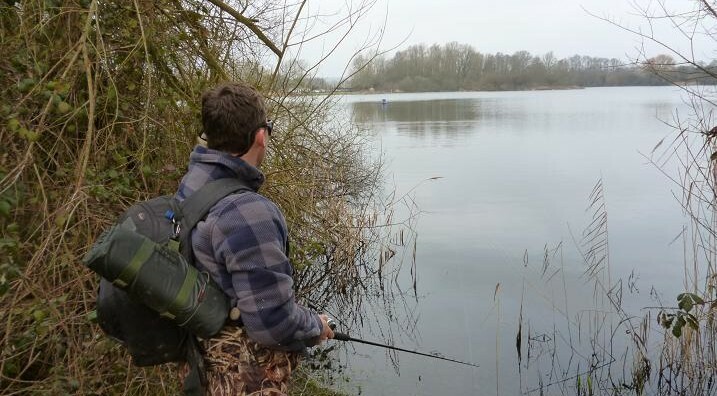 For a moment I had that sinking feeling, thinking I had hooked the bottom, but raising the rod to test my theory, the rod pulled down violently and stayed there as the brooding monster decided my fate. I knew I was just a passenger on this trip and with only a 2lb 8 oz hook link, was in no position to dictate terms. After what seemed an age, the float tip began to move upstream and accelerated beyond the fallen tree as I gave line, my rod beneath the surface in an arc. Upstream the river shallows and I could hear the slow wallowing splash of the unseen beast of a fish and just as I thought that I stood a chance with it, the line went slack and I reeled back my float rig, minus the hook. I sat in reflection for a moment, before tying on another hook, did I even want to continue? A rumble of thunder from an angry sky made my mind up for me. It was going to chuck down and I didn’t fancy carrying my gear back up the lane in another downpour. A quick photo and my seven fish returned, I packed away with speed, lumbering back to the van with my gear, just as spots of rain were splatting on the already waterlogged surface of the lane. Having parked next to the Road Closed due to Flooding sign, which was ready for the next onslaught, I loaded up, switched the wipers to full and splashed home.